A lecture focused on reducing implicit race and gender bias in healthcare, sponsored by the Feinberg Academy of Medical Educators, was attended by faculty, students, residents and staff. 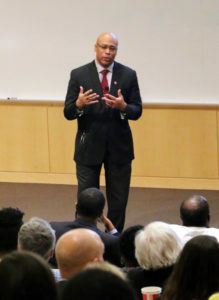 Everyone has implicit biases, and recognizing them is an important first step to reducing healthcare disparities and promoting fairness in medical school admissions, explained Quinn Capers IV, MD, associate dean for admissions at the Ohio State University College of Medicine, during a recent Today’s Innovations in Medical Education (TIME) Lecture at Feinberg. During his lecture, Capers explained the concept of implicit race and gender bias, discussed how it manifests in healthcare and medical school admissions, and shared best strategies for reducing its impact. 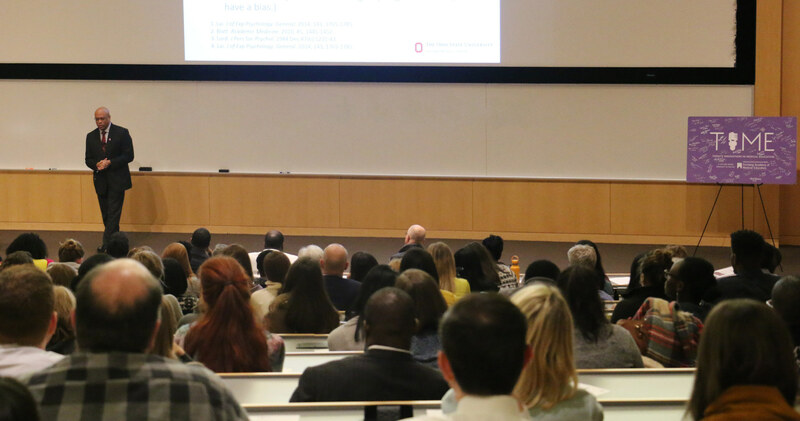 The lecture was delivered by Quinn Capers IV, MD, associate dean for admissions at the Ohio State University College of Medicine. “We want to be sure that we’re giving our patients everything that we have. Our unconscious mind, though, can hijack our good intentions,” said Capers, also associate professor of Medicine and program director of the Interventional Cardiology Fellowship. The lecture, held November 8, was attended by Feinberg faculty, students, residents and staff. TIME, sponsored by the Feinberg Academy of Medical Educators (FAME), is a monthly lecture series dedicated to highlighting technological advances, new pedagogy and best practices in health professions education. Capers was introduced by Diane B. Wayne, ’91 MD, vice dean for Education and the Dr. John Sherman Appleman Professor of Medical Education. Earlier in the day, Capers also led a workshop for 50 Feinberg admissions and medical education faculty and staff on reducing implicit bias. As associate dean of admissions at the Ohio State University, Capers instituted a holistic review of application materials and also began bias reduction training. All members of the admissions committee took the implicit association test (IAT), which is used to determine biases outside of a person’s conscious control. The results indicated that members of the admissions committee showed significant levels of implicit white preference. In a follow-up survey, however, most respondents said that the IAT and training led by Capers would help reduce bias moving forward. The entering class that followed the training intervention was the most diverse in the history of the Ohio State University College of Medicine at that time. Capers explained that it wasn’t that the medical school admitted more underrepresented minority students; rather, a greater proportion of admitted underrepresented students decided to matriculate. The invention was successful, and the results were published in a study in the journal Academic Medicine in 2017. During his talk, Capers also shared key strategies to reduce implicit bias, including forming a common identity with others through shared interests and activities, and spending time with individuals you admire from groups against which you potentially have an unconscious bias. Following the lecture, participants gathered for a reception sponsored by the Daniel Hale Williams Society.